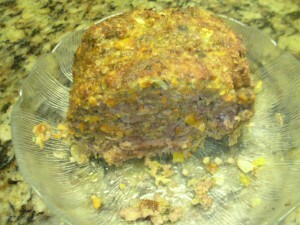 Even though meatloaf has long been a mainstay in the American diet, it has its origins in Europe. The Romans as early as the 5th Century had a version of meatloaf. Every European country as well as the Philippines seems to have its own version. Meatloaf is versatile, filling, nourishing and makes great sandwiches. 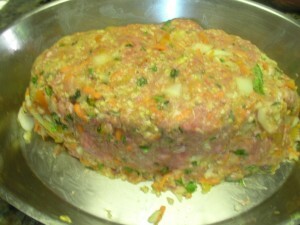 Meatloaf can be made from a variety of meats and can include a large number of other ingredients as well. The basic ingredients would be chopped or ground meat and depending on the origin this could include beef, pork, veal, lamb or venison. Today it is common to use ground turkey or chicken as well. A binder such as eggs is used to hold the meat together and usually a filler such as bread crumbs, matzoh meal or oatmeal is used. Salt, pepper, mustard and/or A-1 Sauce, tomato sauce, barbecue sauce or horseradish can also be used. In addition to the meat, binder and filler, a variety of vegetables can also be used to give the meatloaf more interest and nutrition. For my meatloaf I use chopped onion, shredded carrot, diced celery, minced red & yellow bell peppers as well as parsley and garlic and sometimes basil. For the seasoning, I use salt, pepper and mustard. Some people like to use hard-cooked eggs baked into the loaf and this does allow for more interest, but the loaf is much easier to slice without the addition of th eggs. When I make meatloaf, I always make twice as much as we are going to need. One loaf is baked for dinner with enough left over for sandwiches and the other loaf is frozen for a later date. I always freeze it unbaked so that we have a freshly baked loaf when we get around to using the second one. Another thing you can do with the half batch to freeze is to shape the mixture into meatballs and use it for an entirely different different such as Spaghetti and Meatballs or Meatball Stroganoff. Meatloaf can be baked in a loaf pan, but better results are obtained if the loaf is free formed and then put in a baking pan. This allows the juices and fat to be released without collecting on the sides of the loaf. If desired, when the meatloaf is finished baking, it can be transferred to a serving dish and then gravy can be made from the drippings. The meatloaf gravy can be used for another dinner for hot meatloaf sandwiches. Our menu tonight included meatloaf, mashed potatoes and a green salad with a lemon/vinaigrette. The leftover meatloaf will be made into cold sandwiches with pickles, mustard, mayonnaise, lettuce, tomatoes, cucumbers and sprouts. The next time you make meatloaf try using your imagination and pleasing your tastebuds. You can do just about anything you want. One variation is baking the meatloaf with strips of bacon on top. This will give an additional flavor boost if you like the taste of bacon. Youo can also try using soy sauce, cilantro and ginger for an Asian flavor. Cooked or minute rice can be used instead of the oatmeal or bread crumbs. Whichever way you do it, enjoy!